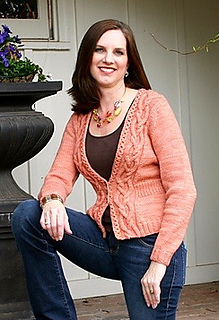 Bust: 35 (39, 43, 47, 51)"
This deep V neck cardi has many slimming knitting tricks built right in to flatter one and all. The wave cable follows the neck shaping using fully fashioned shaping. Ribbing cleverly nips you in right at the waist, while the extra deep v and the flair at the hips complete the hourglass shape. The buttonholes are placed inside the honeycomb cable that travels down the v neck. Bust: 35 (39, 43, 47, 51)”/89 (99, 109, 119, 130) cm, buttoned. 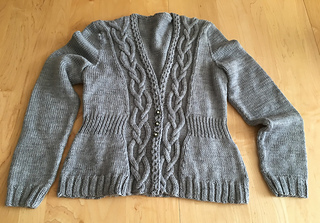 Cardigan shown measures 35”. Stitch Markers (m); removable m; cable needle (cn); tapestry needle; three 3/4” (1.9 cm) buttons.